Home Sweet Home: What Determines the Cost of Your Homeowners Insurance? Whether it’s for car insurance, homeowners insurance, or any other type of protection, there’s a high chance you’re overpaying for coverage. Whether or not you realize it, there are lots of things that determine the cost of a policy from your credit rating to the size of your income. 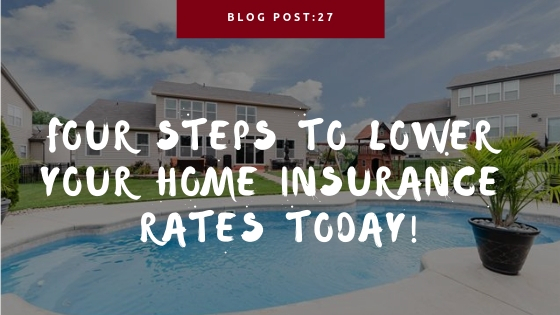 If you’re not aware of how much you should be paying for insurance on your home, you need to learn some major factors. Here are some of the factors to consider when you’re trying to cut back on insurance costs. Your deductible determines basically how often you’ll be bothering your insurance company for help. The deductible is how much you contribute toward losses before the insurance kicks in their share. Work to choose the right deductible amount for you. The higher your deductible is, the more money you save on premium payments but also the fewer things insurance pays for. Most insurance companies offer deductibles starting at $500. If you’re willing to go to at least $1,000 or higher, you can see savings on your on monthly premiums and likely save significant money over time. Insurance for homeowners leads to savings when selecting a higher deductible. Depending on where you live, your deductible should be balanced more carefully. People who live in areas with many natural disasters or with a high rate of property damage by external sources need their insurance often. Disaster-prone regions of the country require people to make careful insurance decisions. On the east coast, winds, rain, and snow are problems that need to be mitigated. On the west coast, there are hail storms, earthquakes, and fires to contend with. The midwest, can have tornados, hail storms, and severe winds to plan for. Your deductible needs to be considered when it comes to what sorts of natural disasters arise. Wood-burning stoves bring a pleasant aura to a home and a natural heat source from something more renewable than coal or natural gas. However, for all that they bring to your home, they also have the potential to change your homeowner’s insurance premiums. In an older home, a wood-burning stove might be one of the only ways to provide heat but if it’s not properly maintained, or installed it changes your insurance situation. A wood-burning stove must be installed by a licensed contractor and meet a series of code requirements to ensure that it’s safe. If you can’t provide this information to your insurance company, they won’t feel assured that it’s not going to cause a problem. If you want to avoid big jumps in your premium or avoid additional costs, provide your insurance carrier some proof that it’s up to code and regularly maintained. Put a smoke detector near the stove and others all throughout the house. Purchase fire extinguishers that are easily accessible and let your agent know you have one. If you make your home safer along with having a wood burning stove, you’ll enjoy the pleasant atmosphere at no additional cost. If you work from home and run your own small business, you’re saving on costs left and right. First off, you’re not paying for any real estate. Secondly, you won’t have any painful commutes and you can ensure that you’re always to work on time. However, when you have a home business, especially one that people are going to visit, you need to have a different type of insurance. For the equipment, tools, and vehicles that are important to your work, there are insurance options to protect it all. If you have an existing insurance policy for your home, you may be able to purchase an in home business endorsement to extend coverage. This type of endorsement adds additional property coverage and some limited liability, you may be able to add it all for very little money. Businesses that are part-time, have no “foot traffic”, or don’t spend a lot on equipment from year to year are best poised to take advantage of these limits. For more robust needs, there are in-home business policies specific to working from home. They give you the features found in commercial policies but with lower limits and lower premiums. You’ll even get the bonus of liability to cover injuries and accidents with a variety of coverage limits that can be adjusted to fit the size of your business. The age of your home and it’s upkeep is vital to calculating how much you’ll pay for insurance. No insurance company wants to provide a policy for a house that’s about to collapse. And if a house is made out of highly flammable materials in a region with wild fires, expect the cost of insurance to go up. When a company provides a policy, they consider how much it’ll cost to replace or rebuild the home. If the home was built with expensive materials in a place that’s prone to earthquakes, your policy is going to be higher than a one-story brick house built in the Midwest. As a home ages, the materials to replace and repair things become harder to find and more expensive to create. Additionally, very old homes may have building materials that are no longer up to code which can cause extreme increases in home insurance quotes or ineligibility. Homeowners insurance is there to help give you reassurance that your home is protected no matter what. Since a home is the largest asset that most people own, there’s no wondering why insurance is a must. Mathenia Insurance Group is here to help St. Louis homeowners find the best insurance quotes to protect what’s important. If you have a rental property, here’s everything you need to know about insuring it.